You are currently browsing the archives for Fall/Winter 2010. If yesterday’s post about Chanel’s pre-fall 2011 show put you in the opulent mood and you feel like indulging yourself in some luxurious fabrics, there is no need to wait until next fall. 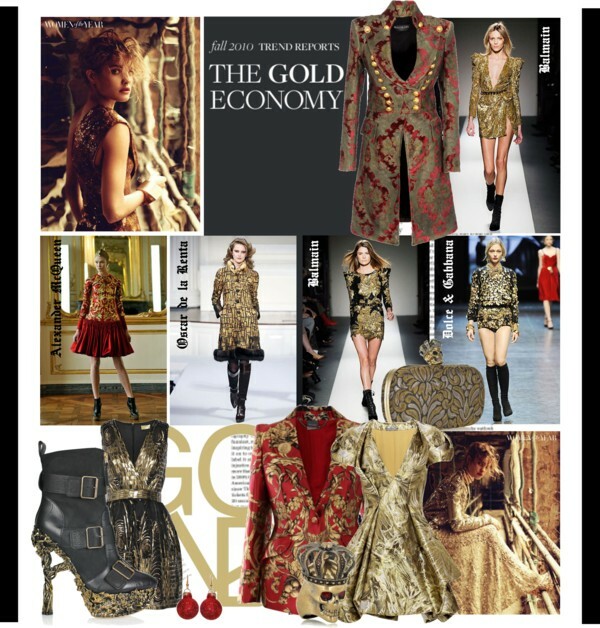 This F/W 2010 has been already about brocade, gold or red fabrics, embellishments and embroideries. Alexander McQueen, Balmain, Dolce & Gabbana and Oscar de la Renta, the forerunners of the festive trend, offer beautiful looks that work perfectly for your X-Mas or New Year’s Eve party. A jacquard coat or blazer is an investment piece that can elevate your look to a complete new level of style. 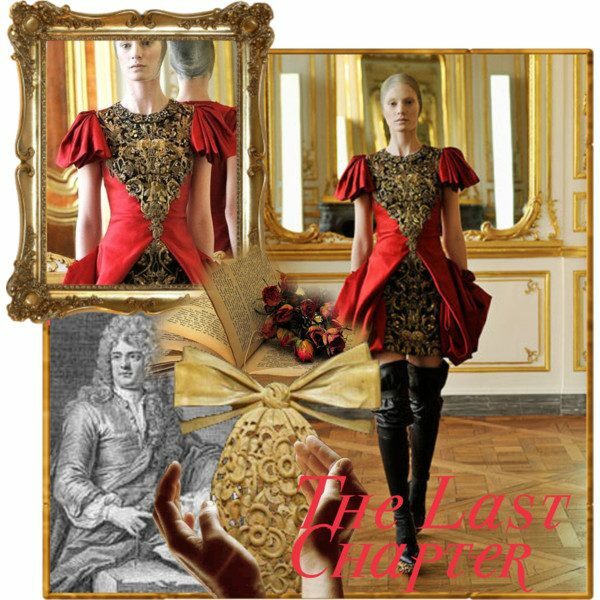 I love my Alexander McQueen red goddess gown with beautiful golden embellishments that I wore recently to a gala in London together with a belt by Matthew Williamson , some sandals by YSL and a vintage Chanel clutch. 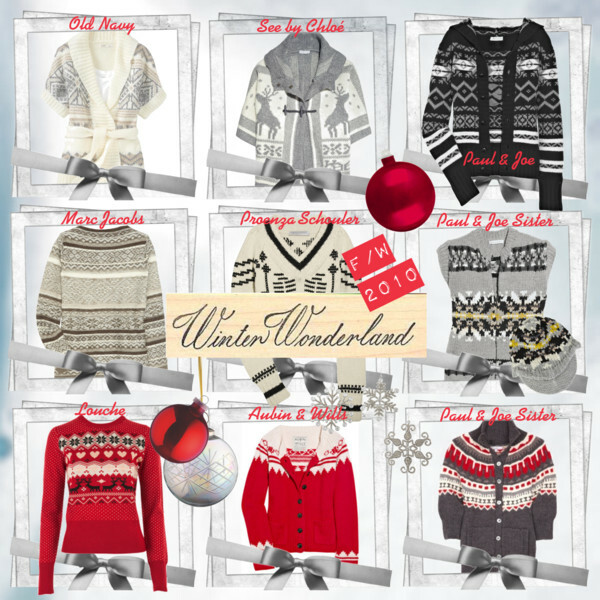 It is the season now to wrap up warm and thanks to many designers we can do this in style. Fair isle sweaters, that used to be the dreaded gifts given by all unknowing grandmas, will be welcomed this Christmas with open arms. 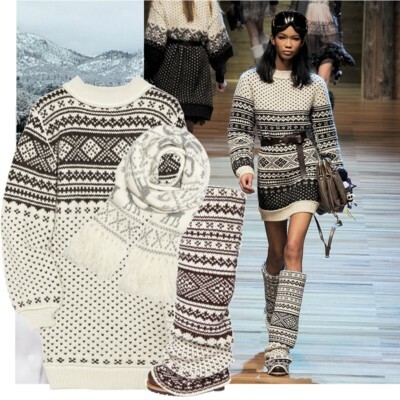 Thanks first and foremost to D&G Dolce & Gabbana, where the traditional patterns had a major fashion moment on the F/W 2010 runway, the cozy knits are no longer just a ski chalet staple. If you still think that it is a fashion faux pas to wear reindeer or snowflakes emblazoned jumpers, you are completely mistaken, it is almost a sacrilege not to do so. This season, they are officially fashionable. Mountain chic is coming to town. Fair isle knit gets its name from a tiny island north of Scotland where the technique to arrange multiple colours in a pattern was first developed. The secret to a stylish combination is to toughen up the sweet-as-shortbread sweater for example with a goregeous pair of leather hot pants. Please enjoy this large variety I put together for you to update your winter wardrobe… in case that you have not already hidden some in your closet. Available at NET-À-PORTER. I cannot wait to head down the fashion slopes of St. Moritz (may they be of ice or concrete) in my cozy pieces from D&G Dolce & Gabbana. I loved their collection for F/W 2010 so much. Finally a trend that really works in the cold weather! And aren’t those boots just to die for?! For the store locator, please click here. Good news is that you might be lucky to get a gorgeous piece on sale. Yesterday, I hit myself with the corner of a shopping bag into the eye and had to go to the hospital. At least I did it in style. Today, I look like a cyborg and declare red as the colour of the day. As a little treat, I think that I will spoil myself with a red leather piece. 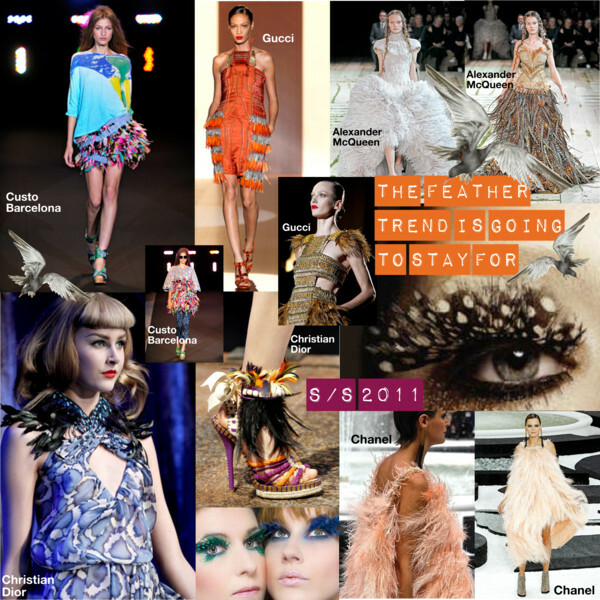 This hot F/W 2010 trend is going to stay for S/S 2011 with Balmain leading the way. For summer, there will be embellishments and extra studs. But those objects of desire have their price. 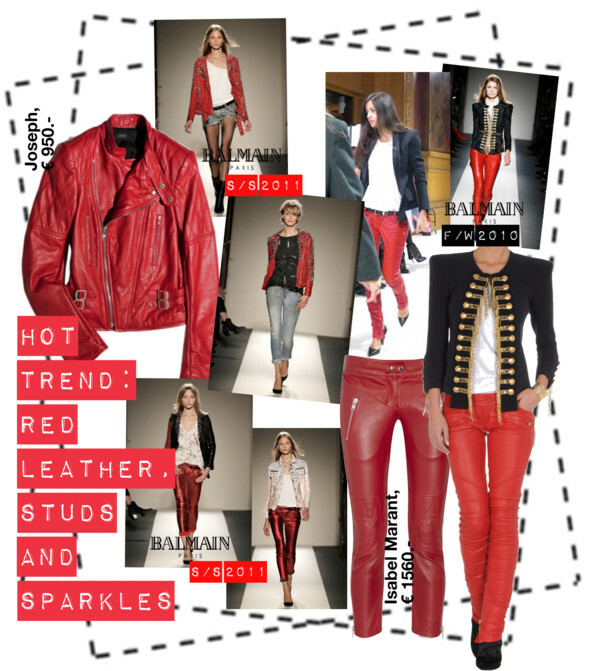 Two super pieces, available at the moment, and not totally overexpensive are Joseph’s red leather biker jacket and Isabel Marant’s cropped pants. Will keep you posted about the dangers while shopping! 26-year-old Alexander Wang has been conquering the high fashion world since his first eponymous collection in 2007. Born and raised in San Francisco, the wunderkind moved to New York City at the age of 18 to try his hand at designing clothes. He attended Parsons School of Design for two years and interned with Mark Jacobs. With a growing fan crowd embracing his modern approach to dressing, he has taken the industry by storm. The bag collection was launched in 2008, followed by the diffusion line T by Alexander Wang and shoes in 2009. Wang has created already many signature It-pieces like the cat’s eye sunglasses spotted first on Lady Gaga or the bottom-studded Rocco bag, Mary–Kate Olsen was frequently seen. He is the recipient of the VOGUE/CFDA Fashion Fund in 2009 as the Swarovski Womenswear Designer of the Year, celebrated again in 2010 with another Swarovski Designer of the Year Award (this time in the Accessory category). Last year he won the Swiss Textiles Award. As a culmination of this year’s gala, the king of sexed-up streetwear cool showed his surprising S/S 2011 collection, seen before on the New York runway. The colour range went from all-white to ivory, mint, curry and terracotta. Deconstructed looks, coverall straps, stiff canvas covered with paint spots and industrial materials like Tyvek played an important role. Rose gold stripes reminding of duct tape and white paint in the models’ hair finally evoke the theme of carpenters. I was very lucky to meet Alex in person and do an interview with him. 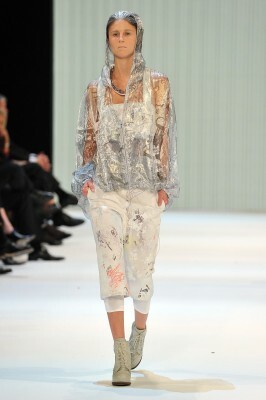 Enjoy his answers and the photos of his S/S 2011 show in Zurich! You are back in Switzerland again. How do you like it here? Unfortunately, I haven’t been out that much. Hopefully I will see more. I was pretty busy. This time, I am enjoying it not to be under the pressure to compete. 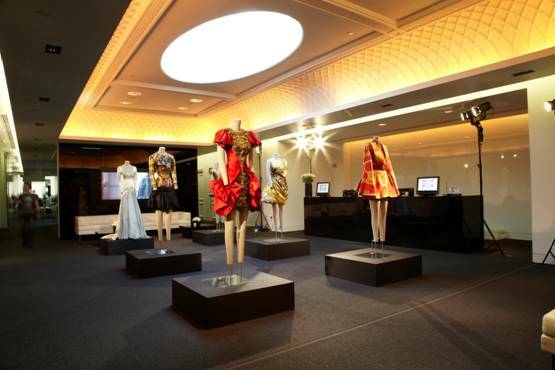 You received a lot of top honours, among them last year’s Swiss Textiles Award. Those prizes are accompanied by a generous financial support. Did that help you building up your company and gaining even more popularity? The monetary component is always an advantage but I wouldn’t say it is a priority. I think just the recognition of being in a different market than where we are based, having that awareness and exposure was definitely something that we experienced over the last year. Especially the opportunity and the ressources to work with the Swiss Textiles Foundation gave us the possibility of developing new fabrications for our S/S 2011 collection, that are much more special and expensive. That was definitely the part that I thought was the top advantage of winning the award. You launched the your first collection in 2007. Despite the financial worldwide crisis, you were on the rise during those for many people very tough last two years. After your Wall Street inspired Fall runway, you are trying something new again, something unexpected was seen on the summer catwalk. After the deconstructed bankers there are now deconstructed carpenters…. What is your message? I want to show the world that they don’t have me all figured out yet. For me, the most important thing is having a very strong point of view that you can evolve. Every designer has their own method of doing things. This is my way of communicating to my customer and to the industry of what I have to say. This season, we didn’t show any black on the runway. It wasn’t something that felt too urban. It wasn’t about doing something downtown or New York. I wanted to create something that felt very optimistic, very uplifting and pure, so with print and colour. That was the outcome of my vision. You are opening your first store in the old Yohji space on Grand street in New York. Will we see more of your own stores in the future? What does your first store mean to you? Hopefully, there will be more to follow but nothing is planned so far. I really wanted to take the time and do something right that I feel very strong about. A lot of people rush into things very quickly. I can’t say that. We obviously had a lot of growth in the last couple of years but sometimes you really have to take a moment to think what you are doing, to consider the next steps and where you want to expand. For us, the store has always been the best possibility to really showcase the full brand and its entirety, where you can really control the image. We are opening it in New York next year. It is an intense process and I want to make sure that each and every detail is done correctly to my standards of perfection. You already did a collaboration with Gap. Can you imagine to do something similiar with H&M, too? We have done a couple of collaborations in the past. I kind of promised myself to be somehow over collaborations in that sort of sense. Any collaboration that I will be doing in the future moving forward will have to speak to the brand on a completely different level. It has to be organic. The period of doing high-low collaborations feels over for me, to what it represents to our company. I think anything that we do now has to be something that feels fresh and looks modern. If we were to do another collaboration, it would have to be definitely different and not with a high street brand. Let’s take all that a little further. If another long-established fashion house asked you to become their new creative director and you could dream of one, which one would it be? I don’t know if I could answer that question right now. The opportunity has definitely been there before but I feel that my focus should be on growing my own brand and company. Building something solid is my top priority at the moment. Wangsters, Wang-ettes, fashion editors come up with all sorts of names for your fan crowd. How does it feel to be the leader of a cult? I find it very flattering of course that people really dedicate themselves to what we are creating. I do what I love and I am very thankful for having an audience that really appreciates my work. That is why I am a designer. I create clothes for people that want to wear, buy and live in them. It is not for my own selfish indulgence, to do something just purely creative. It is about the combination of creativity and yet being commercially buyable, that goes to the stores and makes people desire it. You are very good friends with Erin Wasson? Would you call her your muse? Who is inspiring you? Erin is a friend of mine, for sure, but I rarely use the term of muse. I think it is outdated and old-fashioned. I am inspired by people who work for me that are my family and friends, that I interact with, that I constantly have a communication with. You went to Parsons for a four-year programme and dropped out after two years to focus on your first collection that was mainly about knitwear and sold to over 200 stores. That is absolutely amazing. Did you have any connections? How did you do that? (Laughs) There has been the myths that my family owns production facilities. Probably because we are Chinese, people make that association. Other rumors said that we made a big investment. This is all not true. The brand started off very small with only six styles. It was just that people really responded to the authenticity, to the genuine feeling. When you have someone who really believes in doing something and would do anything to make it happen. Luckily, I had a very big support in terms of a family and I don’t mean just financial. The people around me encouraged me to keep going. My mum who let me leave school and friends who encouraged me to do what I believed in and not listening so much to what the stores were telling me to do, what the showroom wanted me to do. Saying so what, that is my customer, this is the one I want to design for, that is the one, I want to sell to and this how I want to approach it! And I just stuck with it. Can describe the Wang factor, the Wang DNA in three words? I wouldn’t limit it to three words. There is definitely a sense of ease. At the end of the day, it is fashion, it is fun. People need to enjoy it. At a certain point when it is so strict, so controlled, pretentious, I don’t fun with it anymore. And that is not what our brand is about it. It is about individuality, ease and a sense of humour. I always look at it light-heartedly. I love dressing men and women of all different ages and sizes. I don’t want to dictate how to wear my clothes. I get motivated by how people bring their own approach to my designs. 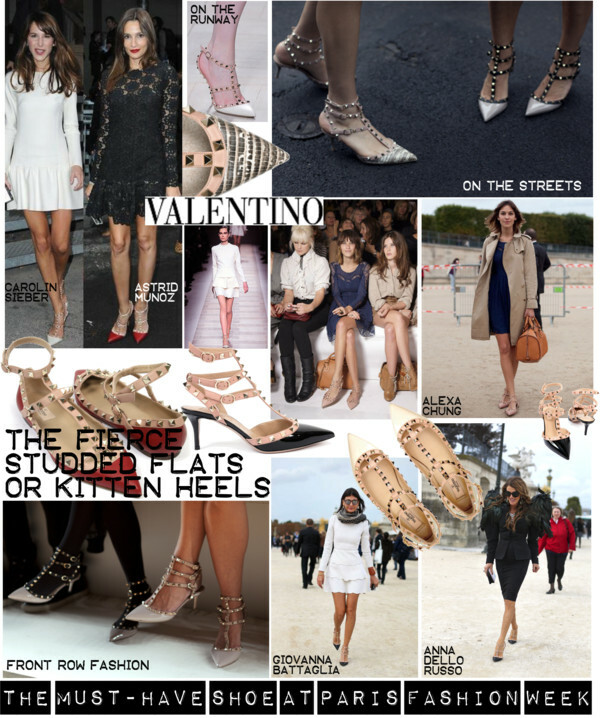 What do you think of all those fashion blogs? Are they the future? This is part of a generation discovering a new method of communicating. It is definitely about being more acknowlegdeable of what is around me, my surrounding and how to communicate. It changed the way that fashion functions. I feel very priviledged to be part of this advanced generation. And I feel very priviledged to have met you. Thanks, Alex, for this lovely interview! It was truly a pleasure to talk to Alexander Wang. He is a very charismatic, energetic person with a very strong vison and full of enthusiasm. On one hand, he seems like the young boy he still is, a little hyper and kind of innocent, on the other side, he is an already experienced business man who goes his own way. This is a very interesting combination and probably his key to success. As you already know if there is one piece fashion is gushing over this F/W 2010, it is the camel coat. Being a true classic and always in style, this season seems to be the perfect time to get one. Many designers showed their own unique take on it. Whether it is made from genuine camel hair or not, it is an investment always worth it. In case you have not decided yet, please find above a summary of the best pieces in stores at the moment. There is something for every taste and budget. I decided to go for the long caramel camel-wool wrap coat by Chloé. It is a very versatile piece. Cinched at the waist with the skinny tan belt or thrown over loose, the overall impact is pure sophistication. I love to wear it tone on tone with my chunky wool cardigan dress by Stella McCartney and my suede Gucci overknee boots for an instant sensual upgrade. The Céline box bag adds the perfect minimalistic chic. The probably most authentic choice is the iconic and much-copied Max Mara cashmere blend overcoat that launched in 1981. It has been the company’s bestseller since nearly thirty years. 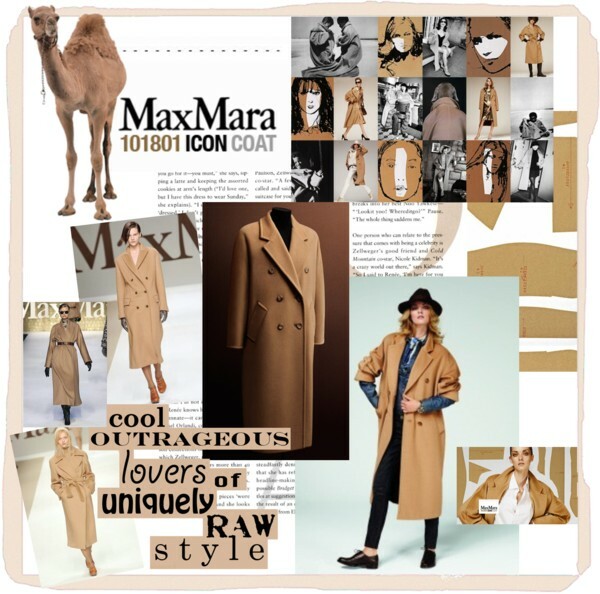 What the trench is to Burberry, the classic camel coat is to Max Mara, specifically the model with the so-called style number “101801”. Therefore, it is no wonder that the Italian brand has recently used the wool and cashmere icon to launch its e-commerce business. The double-breasted outerwear piece has an 42 inch length and kimono sleeves that can be rolled up. Its proportions make it an ideal fit for all women. It can be personalized with a special lining and a name or monogram on the inside label. Available for purchase exclusively at maxmara.com. When I was in London recently, I visited the new headquarters of net-à-porter which are absolutely stunning. 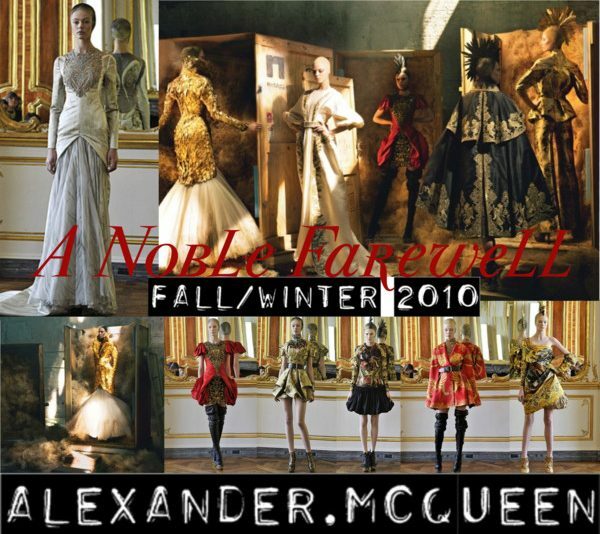 The best part was my exclusive preview of Alexander McQueen’s exquisite F/W 2010 collection. 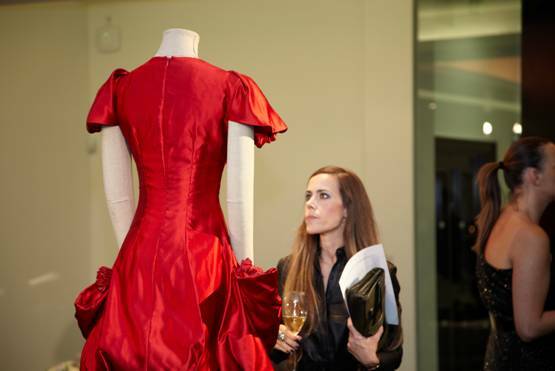 The late Bristish designer’s final work is a piece of art, to be taken literally and owning such a statement collector’s piece is like owning a piece of fashion history. Have a look at my favourites and see how much work and dedication the genius put in his creations. Which one would be your cultural heritage fashionwise? Incrusted harness dress with bulletted duchesse skirt. The printed jacquard was inspired by 3 paintings from Heironymous Bosch entitled “Earthly paradise”, “Garden of Earthly delights”, and “Musical Hell”. The harness has an all over metal sequin embroidery inspired by Byzantine Mosaics. Duchesse dress draped with minimal use of seams and darts to form two exaggerated pockets on the side. The embroidery is a metal based embroidery inspired by the 17th century Dutch wood carver, Grinling Gibbons. The embroidery combines bullion, threadwork, metal sequins, metal flowers, metal beading. This is the last dress that Lee McQueen draped on the mannequin. The print is inspired by the 15th century artist Stephan Lochner’s 3 church paintings of the Inunciation. Print is on silk duchesse placed following the drape of the dress. The underskirt is made of gold painted goose feathers. This dress has a bustier as part of it’s construction. This dress is a combination of the angel wing print translated on Duchesse and chiffon. The print is inspired by the 15th Century Flemish church painter, Hugo van der Goes. The duchesse part of the dress is very sleek with a train creating a stiffness which is softened by the airy chiffon skirt that seems as if revealed. The embroidery is a silver and light gold bullion embroidery backed unto organza. Here are some photos of the beautiful display and me enjoying every detail of those divine creations. Yesterday, at the 62nd Emmy Awards 2010 in Los Angeles, celebrities went on a berry hunt. The most beautiful dresses were the ones in the must-have berry shades of the season. Those tones will remain for Resort 2011. Enjoy the sneak preview as most of the gowns have already been from the upcoming collections. The US-series Mad Men won again in the category top drama. I would give the award fashionwise in the category “top drama gown” to their supporting actress Christina Hendricks in her lilac Zac Posen Resort 2011 dress that flaunted her curves perfectly and looked so stunning in combination with her flame-red hair. On the F/W 2010 runways, berry tones were seen everywhere as if the designers have had all mixed berries for desert while creating their collections. The bright shades were combined in all ways. I put some outfits together to show you how those hues combined together can make a strong statement and instantly update your wardrobe. Red with violet, fuchsia with ruby, vermillion with plum- everything is possible, just let your imagination run free. 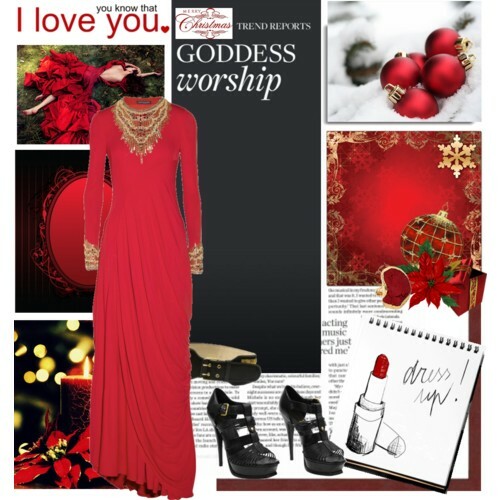 This winter, the LBD (Little Black Dress) is taken hostage by the LRD (Little Red Dress). So chances are very high that you might get scarlet fever soon. 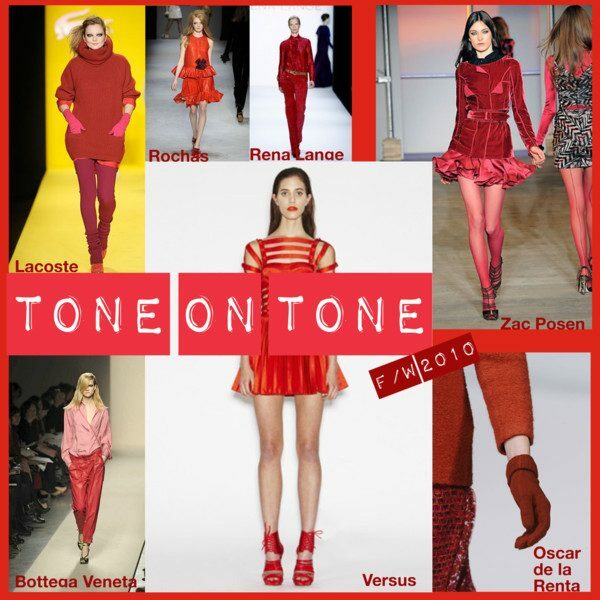 The bright vibrant tone is very contagious especially when worn tone on tone. Accessorize it with matching pumps and a bag in the same colour family for head-to-toe chic. I am totally in love with Bottega Veneta‘s tone on tone looks. How about you? Have I whet your appetite for mixed berries?